Heading into the unofficial start of the summer, Memorial Day weekend, Mammoth Mountain still has several feet of snow, which would compare with coverage for an above average season during late February. Because of the substantial snowpack, which will take quite some time to melt, the outdoor recreational opportunities will be limited. Camping, hiking, and even golf may not be an option until July. Although most of the snow has melted from the Snowcreek golf course, the flooding is an issue with the snow that has just begun to melt from the Sherwins and Crest. Mammoth has had some short bursts of warm weather, which has started the snowmelt, but we haven’t seen anything yet! The Snowcreek meadow preserve has become one flowing river, which will only intensify once the temperatures turn very warm for extended periods of time. Enormous amounts of snow can be great fun in the winter months for skiing, but can slow down the summer recreational activities in the higher elevations due to the time it takes for the snow to melt. It is questionable as to when the campgrounds surrounding the lakes basin will be clear of snow and open for camping this summer. The HWY 120 to Yosemite isn’t expected to open until July this year as well. There is no doubt that the summer foliage will be exceptional this year with a variety of wild flowers and greenery all over Mammoth. 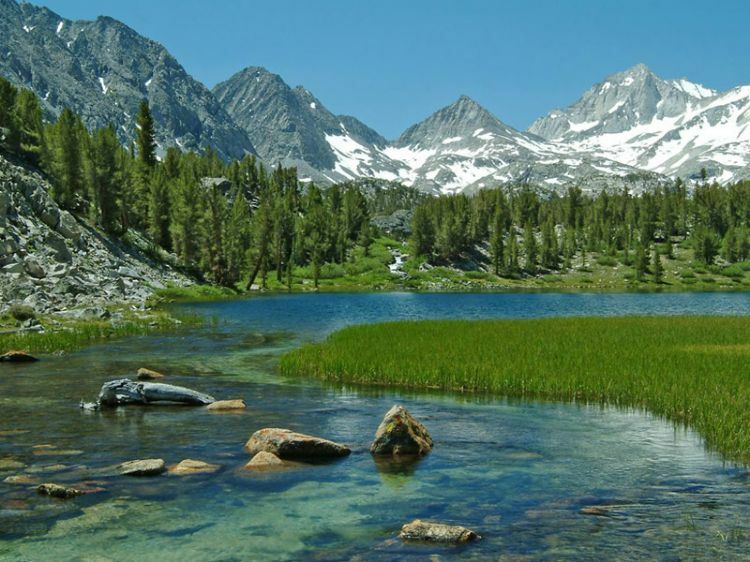 Mammoth Lakes offers exceptional beauty in the summer months that many of the winter visitors have yet to discover. The Mammoth Lakes real estate market experienced a noticeable increase in sales volume during the months of April and May, which is uncharacteristic for this time of year. Typically, after Canyon and Eagle Lodges both close for the winter, sales volume has historically decreased and inventory has increased. This year, we saw the exact opposite of the customary trend entering into the peak of our shoulder season. It seems that the combination of snow (over 600 inches received for the season) along with the recent news of Aspen Skiing Company in the process of acquiring Mammoth Mountain Resorts has some people excited about owning property in Mammoth Lakes. I can’t remember the last time that the inventory was this low for condos, homes and lots right before Memorial Day weekend. As of today, we have only 73 condos on the market, 38 homes and 40 lots on the market. This time last year, we had approximately 165 condos on the market and double the amount of homes. The number of properties in escrow is also approximately double what it was this time last year. Property values also seem to be on the rise. With the very limited inventory and heightened demand, this is to be expected. Many of the new listings that hit the market over the past several weeks were quickly absorbed by buyers waiting on the sidelines. Some of these new listings had multiple offers within days of hitting the market, driving prices up slightly over the asking. Normally, late spring, we tend to see many new listings hit the market and the buying activity doesn’t begin until late July/early August continuing into October (pre-ski season). It will be interesting to see if our limited inventory stays this low and what will happen if the demand stays strong over the summer months… Property owners who paid peak of the market prices in late 2006 and have been holding on, might see this as an opportunity to sell for more than they could have gotten over the past decade (but still under peak of the market pricing). Or, they might decide to wait until the acquisition of Mammoth Mountain Resorts by Aspen Skiing Company goes through, much needed improvements are made to the ski area, etc., and then sell for even more. This is definitely a different dynamic that Mammoth has seen in many years. The lending environment for Mammoth Lakes “condotels” has improved slightly. Wells Fargo Home Mortgage in Mammoth Lakes has been able to navigate around getting project approval for many of the condo developments in Town, with only 8 projects banned due to the “condotel” classification defined by Fannie/Freddie. It doesn’t appear that this will change anytime soon as it would require the dissolution of Fannie/Freddie to achieve financing on these types of developments in resort areas (anything that is run like a hotel with onsite rental office). There are a few other lenders who have been successful in funding loans for some of the projects that Wells Fargo cannot lend on. RPM Mortgage (based out of Newport Beach, CA) has been the most successful lender to fund loans on some of these condotels like Seasons 4, 1849, etc. Tourism has been on the rise year over year, but the past year brought record tourism to Mammoth Lakes consistently throughout summer, fall, winter and now spring. This winter season was the busiest on record for consistent tourism both during the weekdays and weekends throughout ski season (which is still going until probably July 4th). This is all good news for the Town of Mammoth Lakes, which has had its fair share of heartache and issues over the years. Prices remain considerably low given that the Town of Mammoth Lakes has limited inventory, had record-breaking snowfall this winter, is in the process of being acquired by a true ski area resort operator, and is only 4 square miles offering a very limited amount of real estate in this beautiful year-round recreational paradise! Prices will not stay this low forever. If you’ve been on the fence about purchasing your Mammoth Lakes vacation home don’t wait too long. Prices are increasing and will probably continue to increase. As always, please feel free to contact me if you would like to receive new listing notifications, weekly market updates for the Mammoth Lakes Real Estate market, would like to schedule a property showing or have questions regarding any Mammoth Lakes real estate listings.